A filming sign points the way to Pitch Perfect 3's set. It may only be the end of February, but it’s already shaping up to be busy year here in Y’allywood. Driving around town, you’re bound to encounter at least one wild filming sign. Here’s what we’ve seen and where we’ve seen it. Last month, we teased that Pitch Perfect 3 (production code: FRANCE) was just about to begin filming after finishing up a month or so of choreography rehearsal. Now, spotting Anna Kendrick, Elizabeth Banks, Rebel Wilson, or even John Lithgow is a real possibility. We first spotted Pitch Perfect 3 downtown near Georgia State University at the tail end of January. From there, filming moved to the Fox Theatre. Between February 5 and 6, crews worked in Buckhead near Peachtree and Roswell Roads. Signs were spotted off of I-85 in Union City on February 7, and again in Little Five Points at the Corner Tavern the next day. On February 9, the movie filmed in East Point, and in Glenwood Park near the KroBar on February 15. The very next evening, crews took over the Georgia Aquarium to shoot in front of the 6.3 million-gallon Ocean Voyager tank, not to mention socialize with some sea lions. Most recently, Pitch Perfect 3 was back in Glenwood. Also previously teased, Den of Thieves (DoT), starring Gerard Butler, Pablo Schreiber, O’Shea Jackson Jr., and 50 Cent, recently began filming. The bank heist thriller filmed in Stockbridge on February 1. Signs were plopped in Lawrenceville on the 3rd near GA-20 and GA-316. Others were spotted on Piedmont Road near Lindbergh Center throughout early February. On the 10th, production moved near Collier Road and Chattahoochee Avenue. Crews worked around the Kennesaw area on the 12th. They were back in downtown Atlanta on February 21. Come Sunday (SUNDAY), the Netflix original movie about an Evangelical minister who is ostracized after preaching that there is no Hell, continued to film around Atlanta this month. Starring Lakeith Stanfield, Chiwetel Ejiofor, Martin Sheen, and Danny Glover, Come Sunday ended January at a home near Chastain Park. On February 2, a basecamp was spotted at Saint Philip AME Church. The next week, filming took place in Sandy Springs near High Point Road. After that, they shot in Rex, and on February 16, the film was back in the metro area, working in Marietta Square. I, Tonya (IT), the Tonya Harding biopic, had a basecamp in Smyrna on February 6. They were also spotted near Peachtree DeKalb Airport on February 8. The next day, crews filmed in nearby Brookhaven, and on February 10, they were in Austell. Black Panther (ML) had a more subdued month, but still made a few appearances outside the studio. 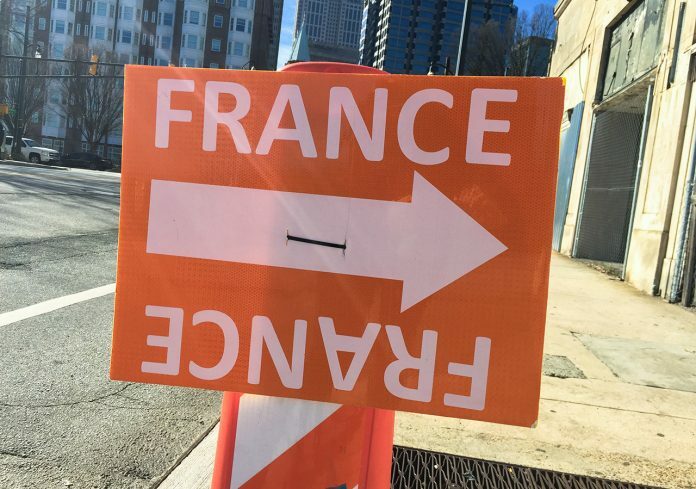 Signs were spotted in Norcross at the end of January and outside of the High Museum on February 6. Stranger Things (BRIDE) has been doing a lot of work out in the woods, and was spotted in Douglasville on the 21st. Survivor’s Remorse (SRS4), currently shooting its fourth season, filmed in Buckhead on February 7 and 8, as well as on the 20th. MacGyver (EYE), which is winding down its first season, was in Marietta Square between January 31 and February 1, at Gwinnett County Airport on the February 2, in downtown Atlanta on February 11, and at the GWCC on February 21. Oprah’s Greenleaf (GL) shot in Peachtree Corners on February 9, and near Winters Chapel Road and Peachtree Industrial Boulevard in Doraville on the 17th. Netflix’s Ozark (BRYDE) was downtown on February 6, and Star (SOS) was in Old Fourth Ward on February 2. Finally this month, there’s a rumor going around that we may be getting yet another Marvel movie at Pinewood Studios. Word on the Internet is that Captain Marvel, which stars Brie Larson, might begin shooting early next year in our neck of the woods. And if rumors aren’t your thing, here’s some confirmed news—we already know it’s going to be awhile before Donald Glover’s Atlanta is back for season two. After all, he’s busy playing tibanna gas mining director/smoothest man in the galaxy Lando Calrissian in a new Star Wars movie. But now, Glover has also been cast to play Simba in a CGI “live action” (think the recent iteration of The Jungle Book) remake of The Lion King. Now that’s what I call having no worries for the rest of your days.